This product is the digital version of “Hokusai Manga”;a set of sketches that Hokusai Katsushika drew for his apprentices in the late Edo period(1603-1868, time sketches were made in 1814 -1878).The sketches represented everything he saw, and imagined. The number of sketches amount to approximately four thousand. Many people are impressed when they come across these sketches. 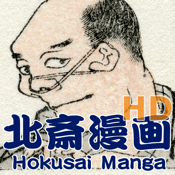 The digital version of “Hokusai Manga” is divided into three separate downloads. Each download contains five volumes of the “Hokusai Manga.” The scanning was based on the replica of “Hokusai Manga” that “Unsodo” (an art book publisher) produced *. “Hokusai Manga” is as famous as the “Thirty-six Views of Mount Fuji” and we’d like you to enjoy this digital product.